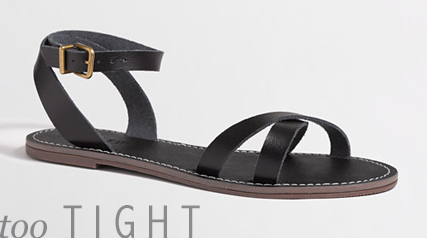 If there's one thing I wish I had to finish up my summer wardrobe, it's a pair of simple black sandals. I've been extremely picky when it comes to these sandals ever since I fell in love with these Apiece Apart sandals I mentioned in my June wishlist. Because I couldn't justify their price tag, I based my search on finding a close match within my budget. I wanted minimal straps (meaning only a few, thin straps), and I preferred straight straps over criss-cross (though I did look at many pairs with criss-cross straps). I really wanted leather sandals over faux leather/plastic, mostly because of the comfort factor. Comfort was number one for me! I also wanted a pair of flat sandals, though I was open to a small heel if I found the right pair. I've been searching for this perfect pair for months. I mean, summer is almost over...and I still don't have these sandals! This pair from American Eagle Outfitters was the first I tried when I started my search. I purchased them and included them in my April budget before I had decided to return them. The cheap, plastic straps rubbed my feet and made it uncomfortable to walk even around my living room, so that was a deal breaker. (I was hoping they were going to be comfortable plastic straps, but those seem to be hard to find, haha.) I figured I may as well return them and use the money towards a pair that checked off all of my boxes. The second pair of sandals I tried was this pair from J.Crew Factory. They look extremely similar to the tan pair I have from Madewell, but I tried them anyway... They were way on sale, so of course I had to (I never learn!). While I liked them in theory, they ended up being too narrow in width. Because I'm susceptible to bunions (thanks Mom! ), I've been more careful about purchasing shoes that are wide enough. For shoes I wouldn't wear every other day, they'd be fine, but I'd wear these sandals pretty much every other day during the summer. It also took me entirely too long to figure out how the ankle strap worked, and it wasn't that comfortable once it was done up. I was pleasantly surprised to find that the straps weren't that uncomfortable for being polyurethane. These would have been included in my upcoming July budget had I kept them, but they didn't make the cut. After two fails and lots of consideration, I decided to pull the plug on a custom pair from Ananias Sandals, a shop on Etsy. I've heard wonderful things about the shop owner and knew he made custom sandals. I wanted to order these last month, but the fact that they are (a) custom and (b) coming from Greece initially deterred me because I knew I would not return them. Well, here we are, almost at the end of summer still wearing my old sandals...and I finally ordered them. I picked a sandal with two thin front straps (I would have gone with one, but knowing me and how often I trip on nothing, two seemed like a better idea) and a simple ankle strap. They are made of Greek leather (yay! ), and I was able to give him the width of my feet so (hopefully) they fit me perfectly! The best part is with shipping, they came to less than $50. I'm really hoping they are exactly what I want, so fingers crossed that my search has finally ended!